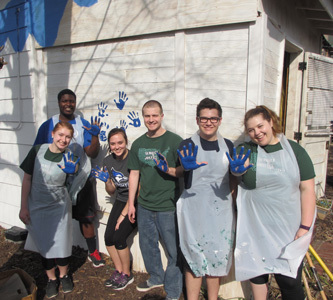 This Spring Break, Creighton University will again send out a large contingent of students as part of the Schlegel Center for Service and Justice’s Spring Service & Justice Trips. The week of March 11, more than 130 students will fan out across the nation, the state and the city for immersion and service-learning experiences at 15 sites. As the Big East basketball tournaments for women and men approach, Creighton will partner with a conference rival, Marquette University, for at two of the sites — Mosaic Bethphage Village in Axtell, Nebraska, and Resurrection Catholic Missions in Montgomery, Alabama. Closer to home, students will also take part in working in North Omaha partnering with Girls Inc. and Abide; the Siena/Francis House; and One World Community Health Center. Upon returning, participating students will share reflections about their experiences at a lunch on April 3, from 11:30 a.m. to 12:30 p.m., in Lower St. John’s. The entire campus community is invited to come and hear the stories of service, justice and inspiration.